With the Motorola MOTOROKR S10 HD Bluetooth headset, you can have all the advantages of Bluetooth connectivity in a true stereo headphone. Most of the Bluetooth headsets I have tried and reviewed are headsets that go in one ear. If they do play music, it is in mono with so so quality. Other Bluetooth devices are speakerphones that are also mono music players. The Motorola MOTOROKR S10 HD is a true stereo headphone with built in Microphone that is connected via Bluetooth. The idea sounds great; let’s see about the actual implementation. I love music, I love Bluetooth and I hate wires, so I was very excited to try out the Motorola MOTOROKR S10 HD and see if it could do what I currently use two or three separate devices to do. 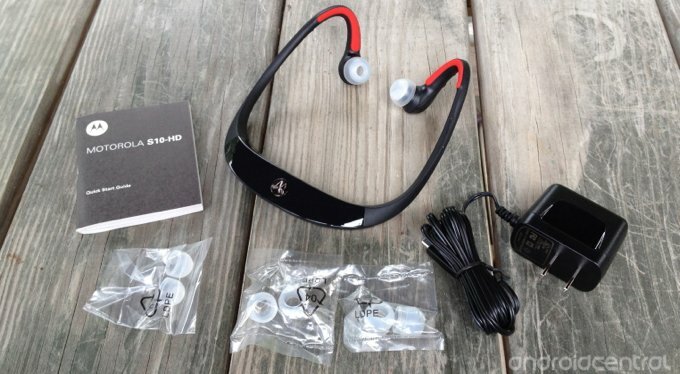 The Motorola MOTOROKR S10 HD comes with the headset, three extra sets of ear gels (varying sizes) a micro USB charger and a rather lengthy instruction manual. Just turn on the Power button and put the MOTOROKR S10 HD around the back of your neck with the ear gels in your ears. The first time you turn the Motorola MOTOROKR S10 HD on, it goes automatically into pairing mode. If you want to pair the Motorola MOTOROKR S10 HD in the future to another device, just hold down the Power button until you see a steady Blue light and it will go back into pairing mode. 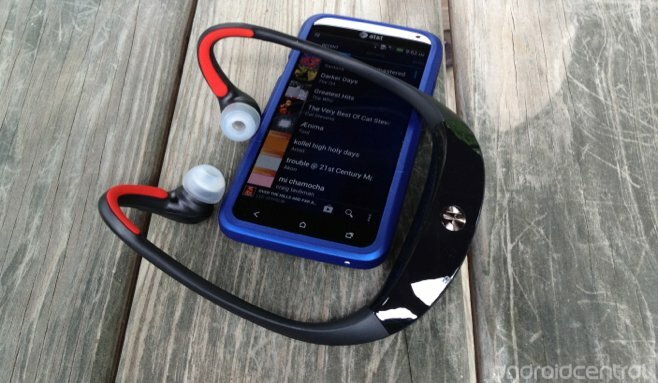 The Motorola MOTOROKR S10 HD functions both as a Bluetooth headset for taking and receiving calls and as a stereo headphone for listening to music. On the left hand side of the headset (near your left ear) there are controls for Volume up (+) and Volume down (-) and a Call button for initiating voice dialing, phone calls or answering a phone call. On the right hand side of the headset there are buttons for the music controls; you can skip Forwards of Backwards if you are listening to a playlist or album and you can Pause/Play the music by touching the middle button. The Power button is along the back of the headset. You can initiate voice controls on your phone by pressing the Call button. If your phone has commands to play music, you can use your voice accordingly. If you are listening to a song and a call comes in, the music will pause, allowing you to take the call. Once the call has ended, the music starts back up. To accept a call coming in, press the Call button, to reject it, press either one of the Volume buttons. Tap the Call button to initiate Voice dialing and hold the button to Redial the last number. You can also Mute a call by pressing the Skip to next song button. One of the added features to the Motorola MOTOROKR S10 HD is that it is designed to be sweat proof. 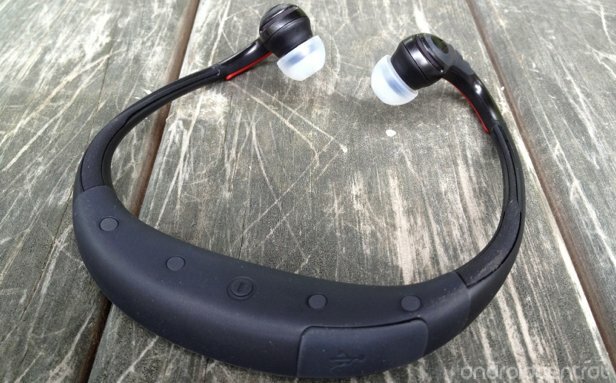 Couple that with no wires and you have, in theory, the ideal headset/headphone for workouts, cutting the grass or anything else that can take a toll on standard wired headphones. The Motorola MOTOROKR S10 HD are somewhat big and heavy. They are also weighted towards the back half which sits on your neck. The protrusion of the back half of the headset behind my neck limited my range of motion – especially the ability to life up my head. An additional issue for me is that I wear glasses. I was unable to find a comfortable way to have these on without them pushing down on my glasses behind my ears. I had used the S 9’s previously and felt they were too big for my ears. 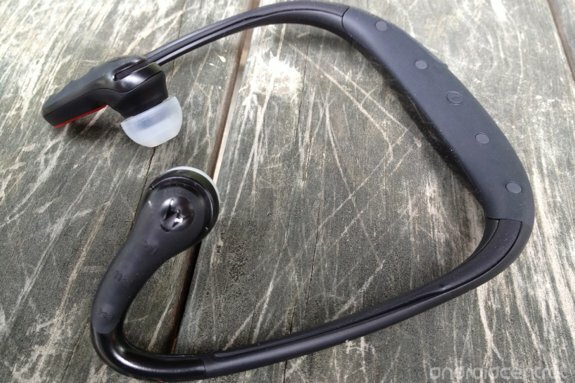 The Motorola MOTOROKR S10 HD come with smaller ear gels which fit nicely. The microphone for the Motorola MOTOROKR S10 HD is located by the right hand earpiece. Since it is nowhere near your mouth, I did have a few callers say it was tough to understand what I was saying. However, since this is a good quality stereo headset, I could really hear calls well. They were loud and clear. The Motorola MOTOROKR S10 HD support A2DP audio streaming meaning that when the headset is connected, you can stream your music from your Android phone right to the headset. You can also Pause/Play, Skip and go back a song in a Playlist or album by using the Music controls. The Motorola MOTOROKR S10 HD is really designed to be a stereo headphone which can also take calls. Music quality was really just OK with the Motorola MOTOROKR S10 HD. A wired stereo headset at the same price point will almost always give better sound to your music. Music over Bluetooth is just an iffy thing. Another issue was that this headset does not play loudly enough for some situations. If you were running or cycling in traffic and wearing these (which is probably not the safest thing to do) the sound was too soft for my tastes. The Motorola MOTOROKR S10 HD was also lacking any appreciable bass response. Mids were ok and high frequencies lacked the detail of wired headsets. The Motorola MOTOROKR S10 HD is a great idea and has a lot of promise. It is great to have a study, sweat proof Bluetooth headset/headphones for working out or being outside. The sound quality, however, coupled with the fact that these can be a bit uncomfortable make it had to keep these in your ears for an extended period of time. If you are looking for a set of Bluetooth headphones that are great for working out and can field phone calls, these might be great for you. If you are an audiophile or if you wear glasses, make sure you try these out somewhere before you buy them.